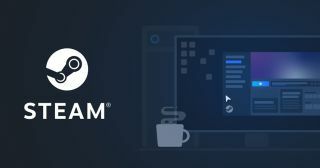 Have we just had a glimpse of Steam's new design? Probably not, but people are speculating anyway. Steam's About page recently had a refresh and as well as explaining what it is ("the ultimate destination for playing, discussing, and creating games"), there's a gif of someone firing up Portal 2 in the launcher. The thing is, it doesn't look like the current interface design. Sure, it's a vague and abstract series of images, but if you didn't expect Steam users would take this as a sign of what it's definitely going to look like in a future update then you don't know them very well. Posters on the r/Steam subreddit have already begun making mockups of theoretical new looks. Here's one by u/inteNsE-- with a very flat design that does look a lot like what the gif shows, with believable labels on what are blank icons in the small gif. Bit of wasted space under the list of friends who play CS: GO, though. And here's another by u/Aveniir which looks a bit less like the gif but makes nicer use of space, at least to my eyes. Note that this mockup shows they have Half-Life 3 installed yet shockingly not listed among their favorites. What a bleak future. We know from Valve's recent blog post about the changes coming to Steam this year that a Library update is on the way. We'll just have to wait and see what it actually looks like, however. Meanwhile, here's a look back at the visual evolution of Steam over the last 15 years.